Plan to make plenty of camping memories with your family when you choose to camp in this 322DS Cardinal Explorer! 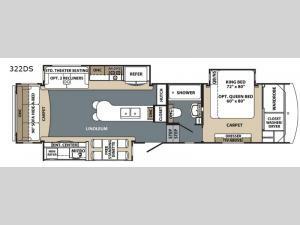 There is plenty of space throughout this fifth wheel with the triple slide outs. Meal prep is easy in this kitchen. There is plenty of counter space thanks to the counter peninsula, plus there is a spot for two bar stools where your kids can enjoy a snack. At night the 90" sofa easily converts into additional sleeping space, if needed. Outside there is an exterior kitchen with a mini refrigerator where you can store drinks or snacks. You will also enjoy the shade from the 16' awning!